If you’re after a really, really good thermometer, then you ought to trust in CDN to get the job done. Whether they’re measuring time or temperature, CDN like to keep things precise – and they focus on nothing else. This level of dedication means that CDN can offer a huge assortment of thermometers and timers, with superior product innovation, quality and value. 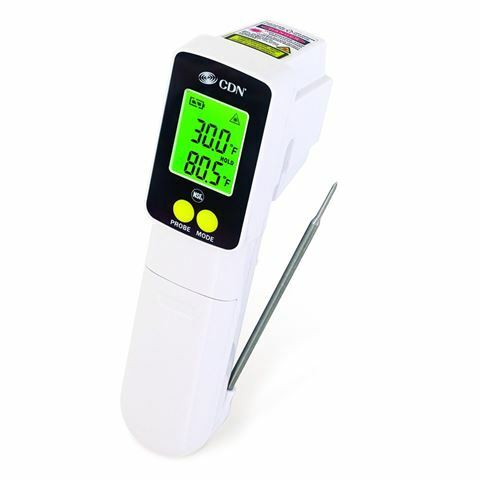 Get professional results every time with the ProAccurate Infrared Gun/Thermocouple Thermometer such as this one. Made from durable plastic, this handy thermometer is easy to use - simply point the thermometer at your target and press the trigger to get an accurate reading of surface temperatures. Or you can flip down the thermocouple probe to get a rapid measurement on internal temperatures, while the intergrated HACCP check backlighting instantly shows if your foods are within the HACCP guidelines. Infrared and thermocouple measure from -60ºC to 350ºC. Infrared sensor provides accurate surface temperature results. Thermocouple probe provdes accurate internal temperature results. Maximum, minimum and lock modes for continuous scanning. Dimensions: 5.5cm (l) x 16cm (h) x 3.5cm (w).